Noni (pronounced NO-nee) is gaining popularity among health enthusiasts who have added it to their dietary regimen. Noni juice is a tropical drink derived from the fruit of the Morinda citrifolia tree. This tree and its fruit grows in Southeast Asia and is primarily found in Polynesia. The fruit itself is a yellow lumpy shape, the size of a mango. Its taste is bitter and it gives off an odor that smells like spoiled cheese. The polynesian people tout the fruits medicinal healing qualities. They have used it to treat infections, arthritis, and constipation. As a health drink, it is manufactured as a juice blend. It’s comprised of 89% noni fruit and 11% grape and blueberry juice concentrates. It contains high levels of antioxidants. Like most fruit juice, it contains mostly carbs. It’s rich in vitamin C, which is essential for skin and immune health. in addition, it has high levels of biotin and folate. Both help convert food into energy. On the other hand, it also has eight grams of sugar, which is a very high amount. This juice contains high levels of antioxidants. The anitoxidants prevent cellular damage caused by free-radical molecules and protect against heart disease. Your body requires a healthy balance of antioxidants and free radicals to maintain optimal health. 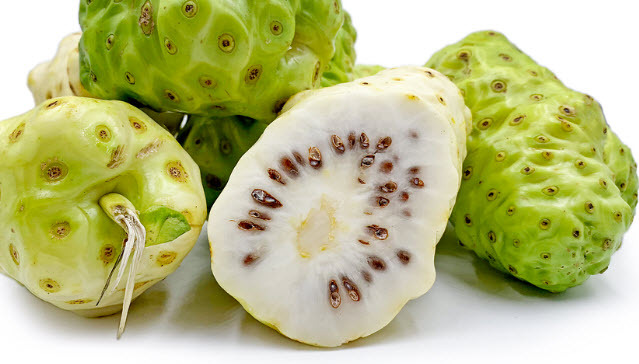 The main antioxidants in noni juice include beta carotene, and vitamins C and E.
Several studies have shown the benefits of this juice in fighting arthritis. In one study, For instance, in one study, patients with degenerative arthritis of the spine took 0.5 ounces of this juice twice daily. Sixty percent reported significantly less back pain and total relief of neck pain. In a different study measuring the juices’s effect on osteoarthritis, three ounces of this juice daily for ninety days had beneficial affects. Patients experienced a significant decrease in the frequency and severity of arthritis pain, and an improved quality of life. A major drawback is the high sugar content in this juice. Eight grams of sugar in a 3.5 ounce serving is extremely high. Continuous intake of this amount of sugar can clash with other medications taken by seniors and negatively effect the liver, heart, and circulation.